It wasn’t until the mid 1990s that GM started offering this engine as a turnkey engine after toning down the horsepower to 450. The 427 was mainly reserved for large truck use although it has a legacy in the muscle car era. The big-block Chevy cars are not hard to pick out in a crowd. We offer the Long Block Version of this engine that is best suited for heavy trucks. There is no small-block engine that can come close to producing the 7.0L displacement. This engine is huge and has even larger power. 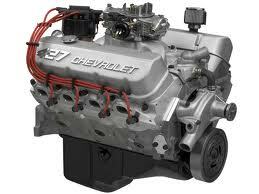 We have these Chevy Big-Block 427 crate engines for sale on this website for guaranteed low online prices. You don’t have to work hard to drop the 427 into your vehicle either. These engines are built right to GM specs and there is nothing that has been added or modified from the original big-block design. What you get is a monster 450 horsepower that is guaranteed to turn a lot of heads. We give all of this to you at one awesomely low price. We don’t have to repeat the engine specs for the 427 on this website. We are sure you already know what they are and just want to get our price. Before we tell you how little you will pay, it’s important to understand what you get for your hard earned money. Our company has been selling engines for decades. We are true professionals in every sense of the word. This is not an eBay website. You interact with real people here that want to ensure you get the best with every purchase. Apart from a custom built big-block 427, you get a great warranty attached to it. There is no need to worry if what you put in your car or any other project car will break down. We warranty our expert work. The shipping prices we charge are not even competitive. They are lower than competitive. We do provide the cost to ship an engine to you in our quotes. We want to make sure the price that you receive with a quote is exactly what you pay. This means no crate engine surprises and no bait and switch tactics like other engine sellers can use. We offer you a low price, you decide to accept it and we ship out the engine immediately. It’s a simple process from a professional company that cares about the engines we put out. Our crate engines and low prices make a perfect pair. We have eased the pains of the quote process to help you get the price you want faster. Use the form that you see for the 427 on this page. What you get in return is your accurate quote. Review the information and then call us with questions or to order. Don’t settle for a small-block when you can get a big-block from us that will give you the horsepower you really want.